I was all set to quilt my Tradewinds quilt today but it's not cooperating at all. It's the second time I've used spray basting, but I don't think that is the problem. It's the first time I've used flannel as a batting instead of regular batting. I wanted something thinner because this is a tablecloth and I thought it would actually be easier to manipulate while quilting. It's heavy and hard to move around. Didn't occur to me that flannel would be heavy. The layers aren't holding together well so things seem to be slipping. The spray and the flannel are not playing nicely together. Could be the weight, could be the thinness of the flannel. It's times like these when I don't understand the people who say they love machine quilting. At the moment I really don't like machine quilting at all. Ah, well. Needed to vent. I will persevere. I'm trying to keep calm and quilt on. Tomorrow is a new month and time for a new fruit and veggie quilt. Hope you'll come back to see my Fresh Tossed salad quilt. But for now I think it's time for a margarita and some Olympics. At least my kitty is calmly quietly oblivious to my distress. Why she wants to do a face plant while she sleeps is beyond me though. Time for Tetris Block 2. When I started this QAL last week, I thought I would make each week's block over the weekend. That way I could stay focused on work during the week and enjoy a change of pace on Saturday. WELL . . . I couldn't wait till the weekend! Since the fabric squares are all cut it's just too easy to whip up a block. I have the grid and the basic shapes set up in Illustrator so it's fun to grab the new shapes of the week and play. When I started, I wasn't sure whether the colors stayed the same for each shape from game to game. Now I know they don't and it's probably for the best. Just in case anyone is wondering, I assigned each of the colors Melissa is using one of my blue/green colors. It's tempting to consider switching it up to suit the block, but I'm going to resist. Here's how my colors correspond to Melissa's. Don't ask why I didn't leave the green green and the blue blue. It didn't occur to me. And since some of you have asked what colors I'm using they are: Kona cotton in Deep Blue, Pacifica, Lagoon, Jade Green, Chartreuse, Kiwi, Clover and White. I know the idea of the real game is to fill all the squares so there aren't any "empty" ones, but the designer in me would rather see some empty spaces. The white squares keep your eye moving around because they add sparkle to the block. So instead of reworking the shapes until I came up with an arrangement that fills the entire block, I just let the empty spaces play out. I did try to balance where they occurred though because I didn't really want two empty spaces next to one another. This week I even opted for a block layout that ended up with 5, yes count them 5, empty spaces. Guess I won't win any Tetris games, but I think this livens up the block. What do you think? Hard to see the difference in the two aqua blues in the lower right from this photo, but there are actually two colors there. Next time I'll probably try to avoid those two colors side-by-side of possible. This is a post about firsts. It's about the first block in the Tetris Quilt Along that's being hosted by Melissa over at Happy Quilting. If you don't know about it, hop over to her site and join in the fun. And don't worry if you don't know what Tetris is or have never played. Melissa gives a great tutorial on how to play to get everyone started. I must admit I'm a Tetris newbie. Another first. I just played my first game. I don't know about you but I'm much better at Tetris quilting than Tetris the game. This is also my first ever quilt-along. Can you believe it? I've never done a quilt-along. I get so caught up working on new designs for my quilts and patterns that I don't make time to participate in much of the online fun. 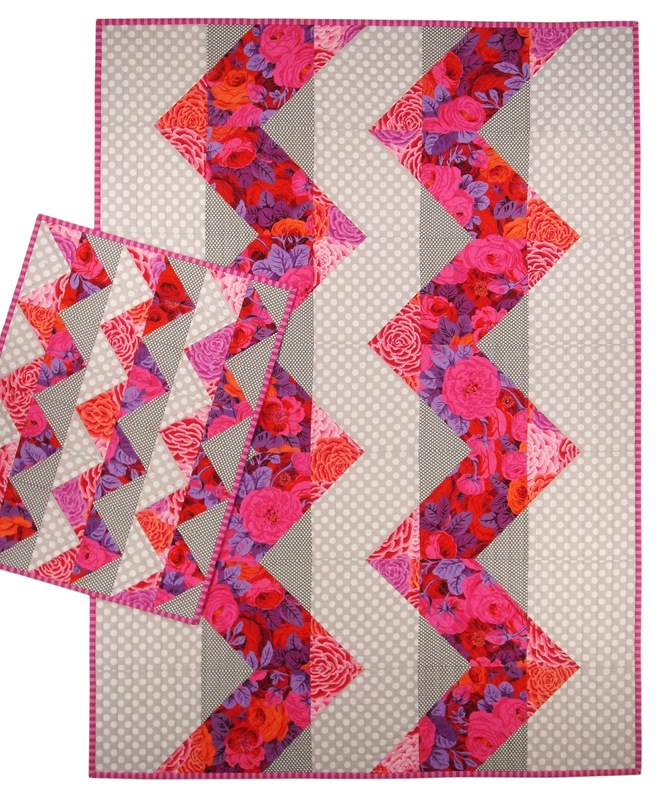 I'm working on finding the right balance between design/quilting and online blogging fun. How do you all do it? This quilt along just spoke to me though. The unplanned, randomness of the blocks is just what I need to break the planning and control I usually bring to my own quilts. Now I'm not going to promise I won't tweak something here or there. It's my nature. But I will try to stick to the Tetris game rules as I understand them. That said, I've already broken the first "rule" by wanting more control over the color palette. I love love color but just wasn't feeling the whole primary color thing. So I'm going with Kona solids in a blue-green palette. Oh, and did I mention I changed the size too? I'm using a smaller 2 1/2" finished square which will give me a nice sized 30 x 45 baby quilt. But that's the nice thing about this QAL. Mellissa is so ok with everyone doing what they want . . . so I am. Here's my first block. I reassigned the colors to the shapes Melissa gave us and "played" the game. And I'm also trying something new to me by using starch. I know I know . . . how can I have quilted for all these years and never used starch? Well, I just haven't. But I'm tired of all those loose threads and limp fabric so I'm giving starch a try. Do you use starch? If so, at what point in the process? Before you cut or after? I'd love to hear your methods and which kind of starch you prefer. So far I love the nice crisp feel of all my little Tetris squares. I just might be a convert if the process isn't too time-consuming. So far so good. Looking forward to seeing what everyone else comes up with and next week's block. I think this is going to be fun. Summer has settled in with temps topping 100- way too often as far as I'm concerned. So what better way to stay cool than to surround myself with some of my favorite cool colored fabrics. They are refreshing and calming amidst all the heat. The fabrics in this quilt remind me of a gentle rain in a lush green garden. I think of hanging gardens and cascading water. Thus was born Cascade . . . another SpringLeaf Studios quilt pattern. I'm excited to share this pattern with all of you because it has so many possibilities. A Scrappy version and a modern take on the ZigZag. Plus 7 additional optional looks . . . all from the same design. 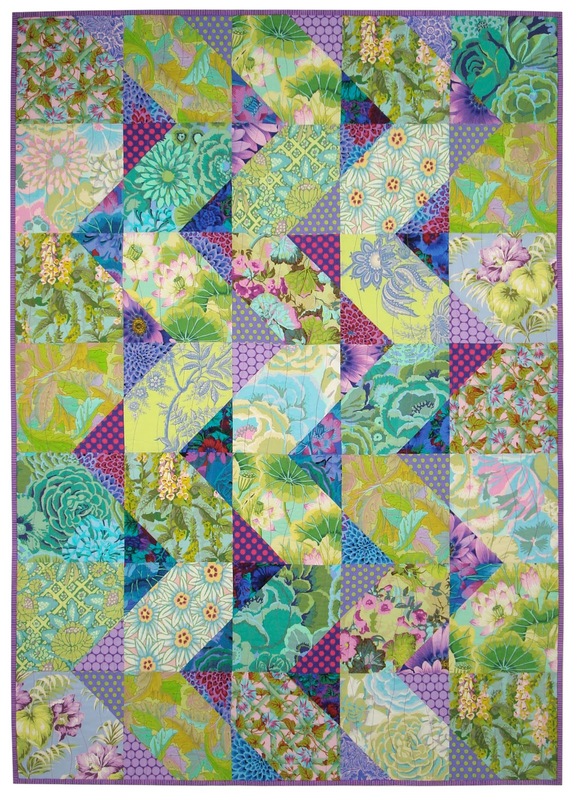 This is the Scrappy version and features fabrics from Kaffe Fassett and Michael Miller. It's perfect for layer cakes, fat quarters and of course large scraps. One of my favorites so far because it feels so refreshing. 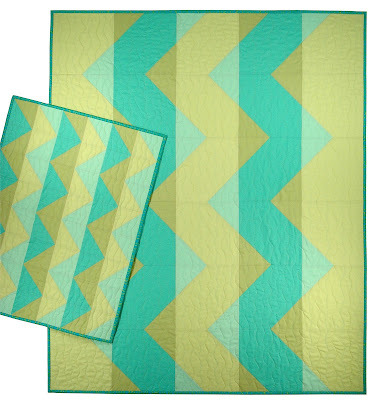 Here's the ZigZag version featuring Kona Cotton solids. This version also works great with prints. I have to admit this is my first all solids quilt, but it won't be my last. There's a calmness about these solids that is very soothing to me. I have so much fun designing quilts. Each time I create a new design I'm always exploring what would happen if I tried this or that. What if I arranged the blocks this way? What if the emphasis is changed? What if this? What if that? Sometimes it's very hard to stop experimenting and actually get to work making the quilt. I need little elves to sew for me... that would be so cool. When I decided to start publishing my quilt designs it seemed like a natural choice to include all these explorations in each pattern. I've never been one to follow patterns exactly as they come. A little change here or there. I'll bet a lot of you feel the same. 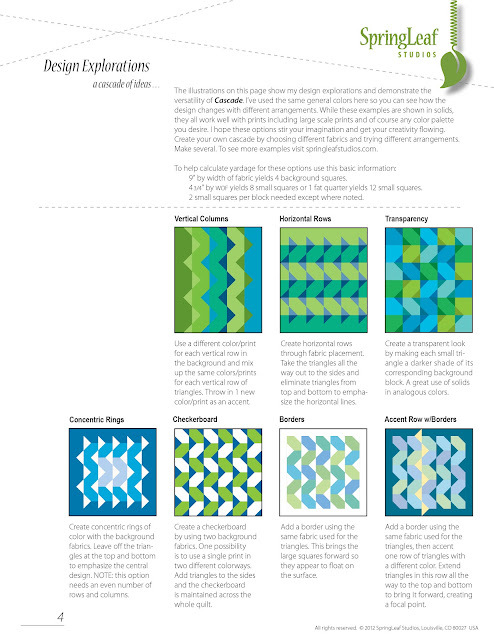 I really want the Design Explorations page provided in my patterns to inspire you to make a quilt the way you want. Not only with fabrics that you love but also with a flare that makes you feel like it's your very own. Here's what the Explorations page looks like. Here's a few other versions of Cascade I've made to give you an idea of how it looks in other fabrics and arrangements. Hope they inspire. Cascade ZigZag made with large scale prints from Kaffe Fassett and Michael Miller. A mini quilt was made from the trimmed leftovers. Cascade made using a checkerboard arrangement of fabrics. Cascade made using a concentric ring arrangement of fabrics. A pillow made from the trimmed leftovers. The pattern gives detailed directions for the pillow. 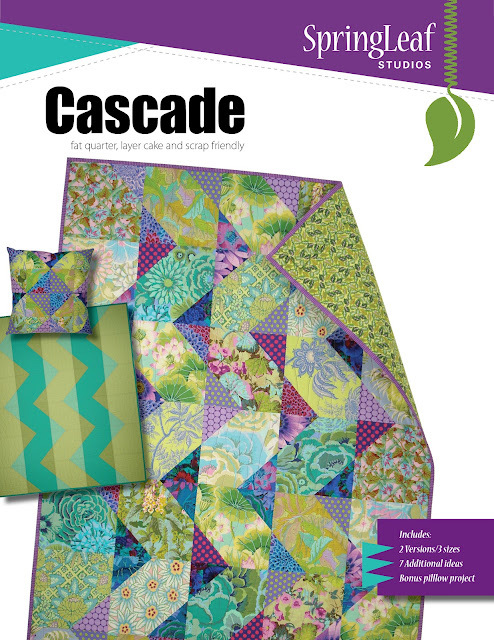 Cascade gives directions and yardage for 2 different versions; Scrappy and ZigZag. It includes 3 sizes; baby, lap/twin, and double/queen. A bonus pillow project is included that's made from the trimmed leftovers of the quilt. Or you can make a mini like I did with the leftovers. And of course it includes the Design Lesson and Exploration sections to inspire you. Cascade is available on Craftsy and in my Etsy shop. Hope you'll give it a look. I'd really love to know what you think. Please leave me a comment and tell me which version is your favorite. Stay cool . . . and quilt on. July means berry pie around here. Not the mouthwatering taste of fresh baked pies even though my husband LOVES cherry pie. Instead it's the eye catching pie combo of all things fabric fruity. Unfortunately for my family, I'm just not a baker or even much of a cook. I cook because we have to eat. But when it comes to fabric recipes I love to whip up a tasty treat to go with my fruit and veggie dish collection. (You can see my citrus collection here). Guess you could say I'm a baker with fabric just like I'm a gardener with fabric. I think it's easier and it definitely lasts longer. When July rolls around it's the month of quilted berries. This is as close as it gets to red, white and blue in my house. I call this quilt "Fresh Baked" I used lots of apple and berry prints set with some creamy pie crust colored prints to evoke the image of a table full of pies. I think the little red check and a basketweave print for the binding give the feel of a picnic. Now if only it weren't 100 degrees outside and we could actually have a picnic. I also used some buttons in the center of each pie just because I wanted a little hand sewn touch.